This is a compilation of two previously published articles. When planning my recent trip to New Zealand’s largest city, I expected to find plenty of things to see and do. 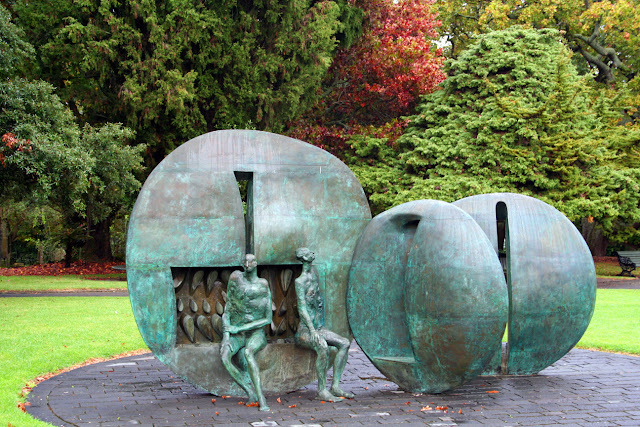 As it turned out, there is as much to do outside of Auckland as there is within its borders. I arrived in Auckland after taking the world’s longest passenger flight (#WLPF), the route between Dubai (DXB) and Auckland International Airport (AKL). U.A.E.-based carrier #Emirates began flying the 8,825-mile route on March 1, and provided me with passage so I could experience the flight. 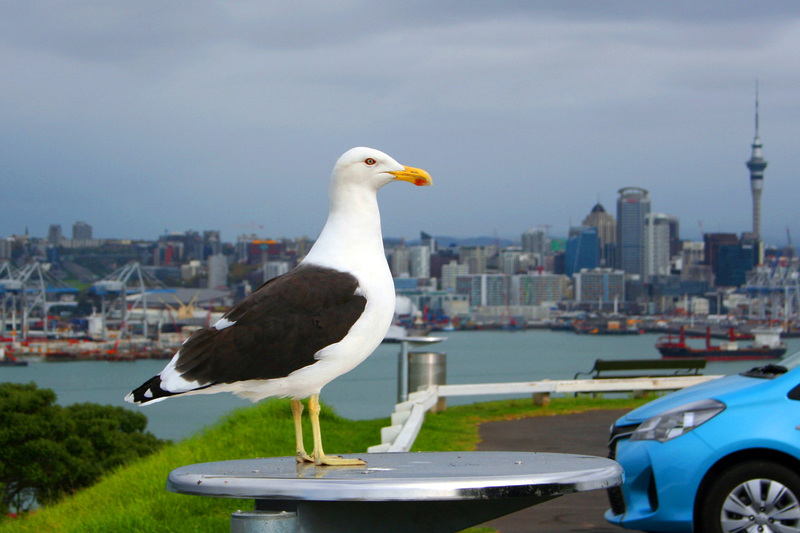 The opportunity to see and experience Auckland was a bonus. A mid-sized city of 1.3 million people on the country’s north island, Auckland is New Zealand’s largest city with 32.4 percent of the country’s population, according to the 2013 census as reported by Statistics New Zealand. That makes it the largest city of the 16 regions in New Zealand. According to local lore, there was a T-shirt some years ago that read, “Auckland: Sydney for beginners.” Today, many locals prefer to think of it as Seattle without so much rain. The Seattle comparison might have been more appropriate 30 years ago before the tech and building boom brought on by the likes of Microsoft, Amazon and other high-profile companies. Still, there are similarities. Auckland has Sky Tower and Seattle has the Space Needle. Both cities are on bodies of water. Both have many islands that can be reached by short boat rides and where visitors can enjoy small towns that range from quaint to funky. Before the construction of Sky Tower, Auckland was struggling to find an identity but today, advertisements in bus shelters, magazines and other publications herald Sky Tower as “an emblem” and the city’s symbol tower, just as the Space Needle from the 1962 World’s Fair is Seattle’s emblem. Construction on the tower was completed in 1997 and today, it is an iconic as the Space Needle, Toronto’s CN Tower, the London Eye and Big Ben, or the Sydney Opera House. At 328 meters, or 1,076 feet, from ground level to the top of the mast, it is the tallest man-made structure in the Southern Hemisphere. The observation deck is located 220 meters above the ground. 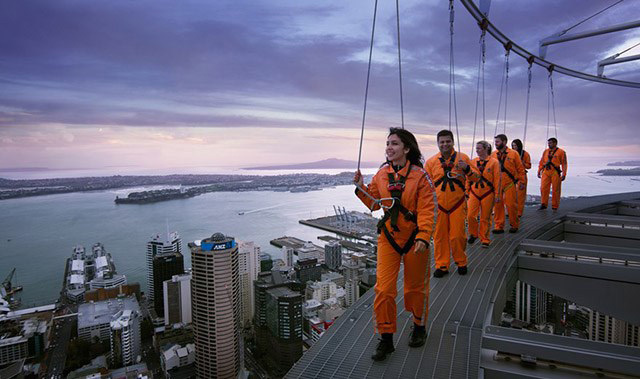 In addition, Sky Tower offers three restaurants and cafes including the obligatory revolving restaurant named Orbit 360˚, a more chic and elegant establishment called The Sugar Club, and a casual venue that serves beverages and snacks called the Sky Cafe. More hard-core thrill seekers may choose the Sky Jump. 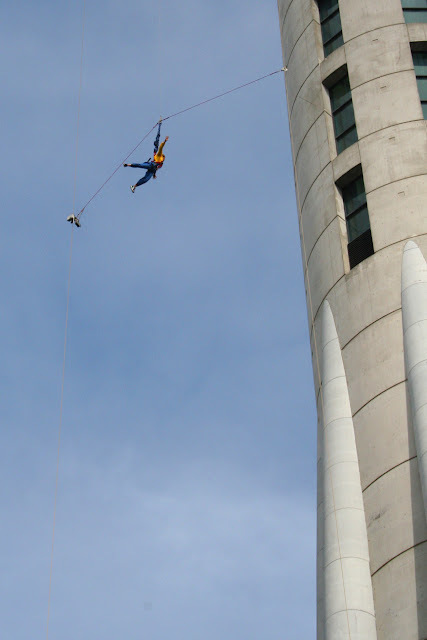 Guests’ descents are controlled by a wire but their falls aren’t slowed until they are relatively close to the ground. Passersby on the streets below inevitably look up when they hear the screams of those hardy (or is it “foolhardy”) souls who choose to take the plunge. 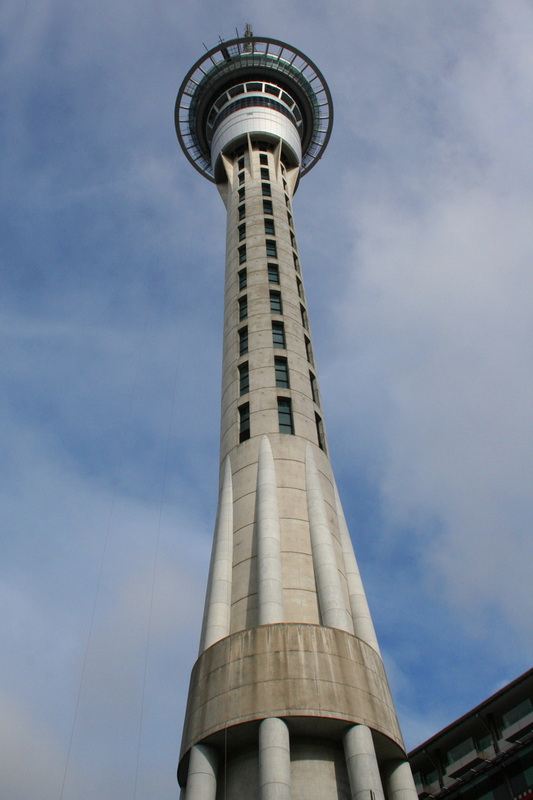 Sky Tower is situated in an area dubbed SKYCITY Auckland, an entertainment venue at ground level that is home to two world-class hotels, the city’s premier dining precinct with over 20 bars and restaurants, a 700 seat theater and a casino. 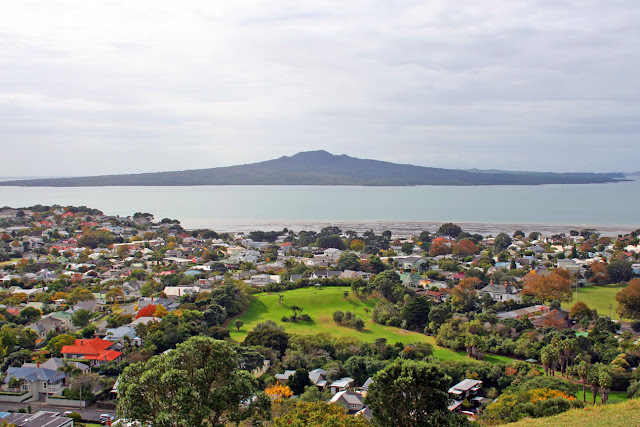 Auckland is home to a university, several parks, lovely churches, and other attractions including Mount Eden, an extinct volcano that overlooks the city from south of the downtown area. 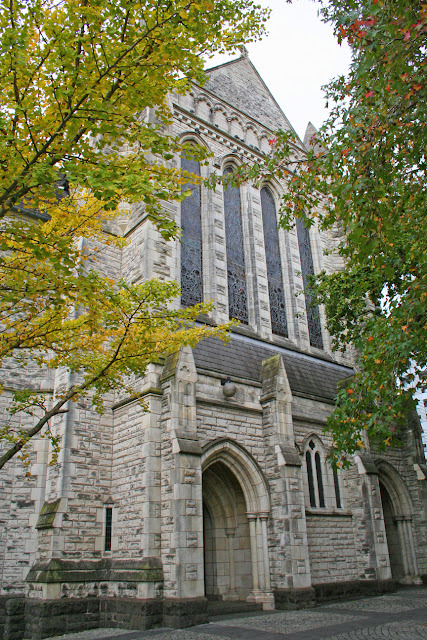 There are also museums, including the New Zealand Maritime Museum which a long-time friend recommended, and other attractions including abundant shopping. The lower end of Queen Street near the Ferry Terminal is like a mini-Rodeo Drive with high-end shops like Gucci, Louis Vuitton, Dior, Prada and other upmarket retailers. Auckland struck me as a very clean city. There was very little litter about and, at least within the downtown and Queen Street core areas, very little graffiti. A representative of the Visitor Information Centre at Queens Wharf told me the city is quite aggressive about removing graffiti when it turns up but candidly admitted there are areas of the city where it is much more prevalent than in the central business district, areas where "You probably wouldn't want to go," she added. Getting around Auckland is fairly easy. The city is small enough that one can walk many places and hop on buses for others. However, even locals I spoke to acknowledge that the local public bus system is a bit confusing. Auckland Transport operates three different bus lines: CityLink for getting around the city center, InnerLink for getting around the inner city (describing areas that are “close in” and not to be confused with U.S. “inner cities”), and OuterLink to get around the outer suburbs. Each has its own fare structure, so carry plenty of coins for maximum flexibility. Bus transportation includes SkyBus, which travels between the city center and Auckland International Airport for NZ$16 each way. Round-trip, or “return,” tickets represent a bit of a savings over two one-way fares. While I enjoyed Emirates’ chauffeur drive service from AKL to my hotel, The Langham, I found SkyBus to be both a convenient and pleasant way to get back to the airport. I caught the bus at a stop about two blocks from my hotel, paid the driver as I entered, and was at the airport in about 25 minutes. In addition, SkyBus offers free Wi-Fi so I was able to catch up on my email en route as well as follow my progress using the Google Maps app. There is also much to do just outside of Auckland. Auckland is called the City of Sails for the large number of sailing vessels that take to the multitude of harbors that abut the city. “Set amongst volcanic islands, it’s the perfect playground for yachties,” effused one website. In fact, of the top 10 things to do in Auckland listed on TripAdvisor, four involve getting away from Auckland, in many cases by boat. Ferries that depart Queens Wharf or Princes Wharf will take visitors just about anywhere they want to go. They run frequently and are reasonably priced. Tour buses, city buses and rental cars are among the options for land excursions. On my first full day in the city, I took at short ride to Devonport, about 15 minutes across the bay. 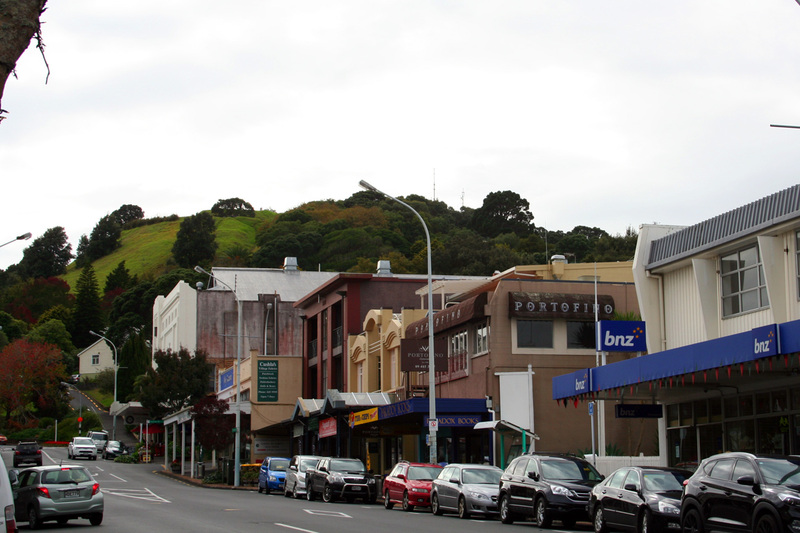 A quaint little seaside town, it had the usual retinue of boutiques, shops and stores but it also has Mount Victoria, an extinct volcano in the middle of town. Avid walkers can climb to the top in about 20 minutes (it is actually a walk along paved roads and not really a climb) or drive to the summit, which is 283 feet above sea level, for some great views of Auckland. Mount Victoria was also the site of Fort Victoria. In 1885, fears that the young colony would be attacked by the Russian Pacific Fleet prompted the fortification of the mountain and the installation of four guns taken from H.M.S. Nelson. Today, a bunker and a decommissioned cannon still remain in place. 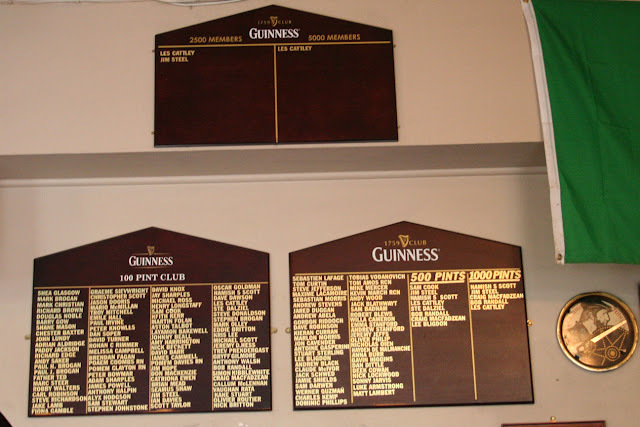 Having worked up an appetite climbing to the top, I decided to have lunch at a pub called The Patriot. Its selection of local beers and "pub grub" was impressive, but not nearly as impressive as its Wall of Fame (or shame, depending on your perspective) where it lists patrons who have downed between 100 and 5,000 pints of Guinness. New Zealand is, of course, known for its wines. At 37 degrees south latitude, it is approximately as far south of the equator as California’s Napa Valley is north. The Marlborough region on the south island is arguably the most famous, but wines are made most everywhere in New Zealand, predominated by two white varietals (Sauvignon Blanc and Pinot Gris) and the red Pinot Noir. 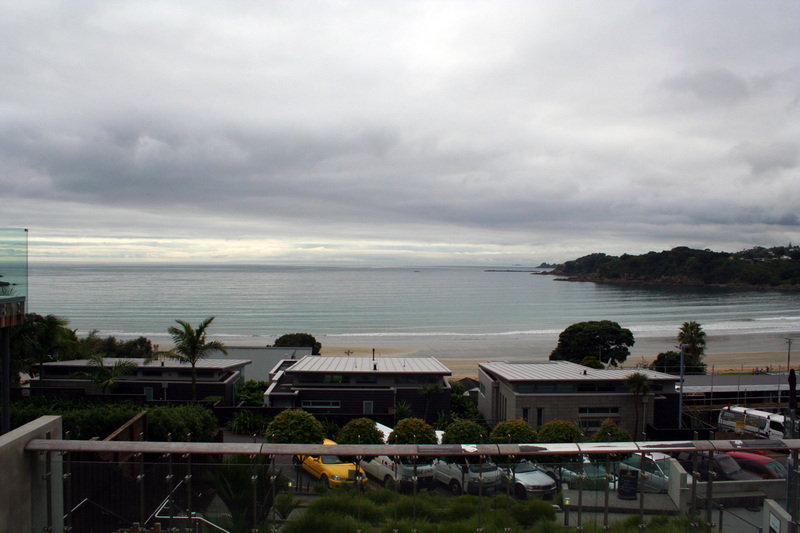 On my second day, I took a 40-minute ferry ride to Waiheke Island, home of at least a dozen and a half wineries. As a traveler who prefers to explore on my own rather than being guided around by the hand, I was planning to take the local bus, which goes fairly close to about a third of the wineries. I figured three would be about my limit. But the good people of Waiheke Island, despite having the wherewithal to spend in excess of NZ$1,000,000 for waterfront homes, have not invested in a bus system that operates more than once an hour. That means an independent traveler like myself, who took the ferry from the Auckland waterfront, would likely have to wait a while for the bus (I was told “Another 25 minutes” when I alighted from the ferry), then spend close to an hour at each winery. Not very workable. There are rental cars available, but the cost is approximately the same as that of taking an organized tour. As well, renting a car in New Zealand brings the challenge of driving on what is “the wrong side of the road” for North Americans and most Europeans, a challenge that could be exacerbated by tasting (perhaps too much) wine. If choosing to rent a car (or even a scooter, for that matter), consider designating a non-drinking driver, as the potential of receiving a D.U.I. should not be ignored. The presumptive level of intoxication is expressed in New Zealand legislation as 50 mg of alcohol per 100 milliliters of blood, which translates to 0.05 percent blood alcohol level (BAL), which is considerably lower that the presumptive impairment levels of 0.08 percent BAL in U.S. states. MY RECOMMENDATION: If you plan to go wine-tasting, book a tour. Certainly, they may be more expensive than doing it on your own but it will save you the hassle and potential exposure of venturing out independently. Many other areas offer different attractions. A long-time and well-traveled friend had the following recommendations of things to see and do, which I was not able to fit in during my brief visit. "Visit Rangitoto Island, attend and All-Blacks rugby match or a cricket match," he said. "If you can get out of Auckland, Rotorua (about 160 kilometers south of Auckland) has a host of Maori-related functions along with geothermal wonders. Visit the Glow Worm Caves and related spelunking at Waitomo (about 190 km south). A visit to Whakapapa (about 350 km south) puts you on the slopes of Mt Doom," he noted. “About 45 kilometers north of Auckland is Puhoi (the pub and clientele are unique), Warkworth (about 60 km north) and Matakana (about 67 km north). I love the pub and Ascension Winery there,” he said. If you are not game to rent a car and try driving on the left-hand side of the road, public transportation to most of these areas is available.